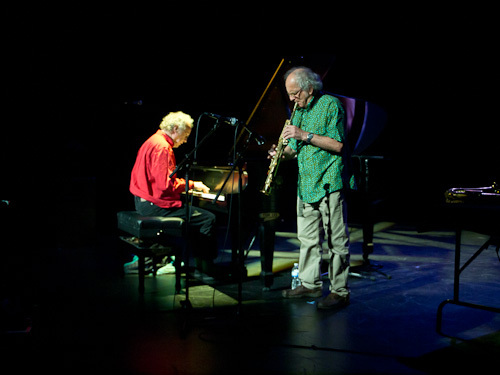 Trevor Watts & Veryan Weston live in Vancouver, July 3, 2011. Photo by Peter Gannushkin. On today’s podcast, I’m incredibly excited to have legendary British free jazz pioneers Trevor Watts and Veryan Weston! Saxophonist Trevor Watts, along with drummer John Stevens, is co-founder of the Spontaneous Music Ensemble, a loosely-knit group of free improvisers first assembled in London in the mid-60’s. The SME’s influence in the avant garde and free improv communities cannot be overstated. Members at various times include Evan Parker, Derek Bailey, Peter Kowald, John Butcher, Julie Tippetts, Robert Calvert, Kenny Wheeler, Roger Smith, Nigel Coombes, Maggie Nichols, Colin Wood, Dave Holland, Barry Guy, and Kent Carter. In addition to his work in the SME, Trevor formed the groups Amalgam and Moiré Music ensemble and has performed with jazz greats such as Steve Lacy, Don Cherry, and Archie Shepp. Pianist Veryan Weston performed with Trevor Watts in Moiré Music and on the duet album 6 Dialogues. He’s also played with the Eddie Prévost Quartet, Lol Coxhill, Phil Minton, and John Butcher. On Friday, July 13th, 2012, Watts and Weston performed together at the Downtown Presbyterian Church in Nashville. It was a phenomenal experience. Trevor and Veryan very kindly gave me permission to record and release the performance, and that’s what you’re about to hear. I recorded the show with two Shure SM58 Beta vocal microphones hard panned left/right, mounted high on mic stands placed in the second pew of the Chapel. The mics went directly into a Marantz digital field recorder. The room’s natural reverb sounds just about right two pews from the performers. In post, I added a light amount of compression, turned up the left channel a little, edited out pauses between songs, and that’s about it. Without further ado, here’s Trevor Watts and Veryan Weston live at the Downtown Presbyterian Church in Nashville. Enjoy!